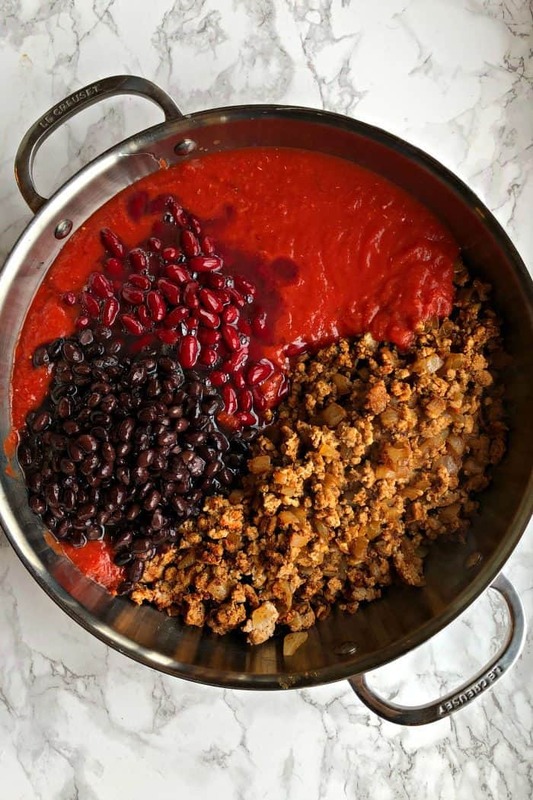 Enjoy this Easy Homemade Chili recipe, made with ground turkey, beans, and the perfect blend of spices! 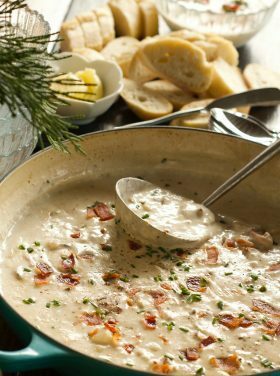 Make on stovetop or in the slow cooker! 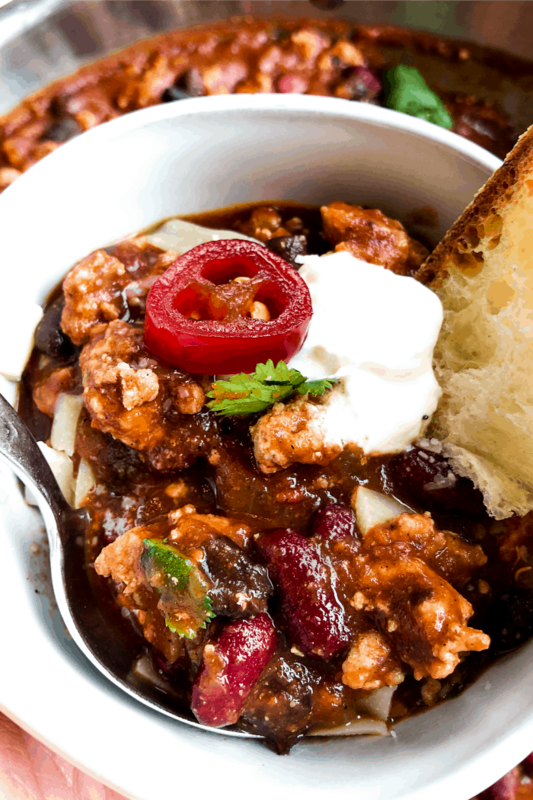 Friends, just in time for winter hosting, serve a big pot of chili. 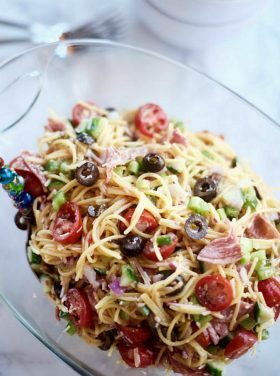 This is one of the easiest meals for entertaining, and if kids are coming? A big party hit every time! It’s great for big kids and little kids! 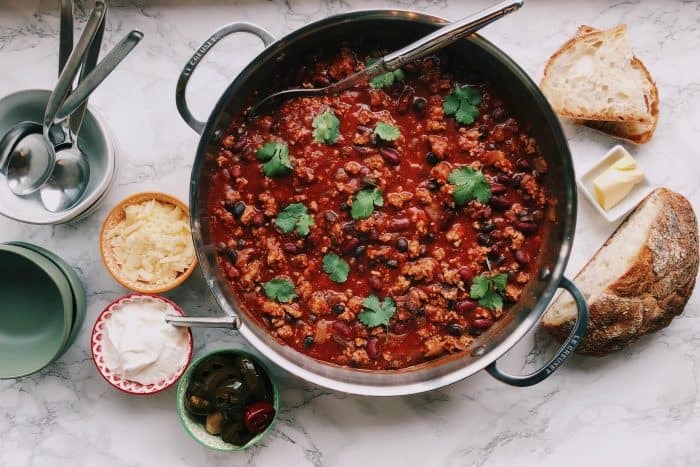 Many times, with a large party, we’ll serve chili! 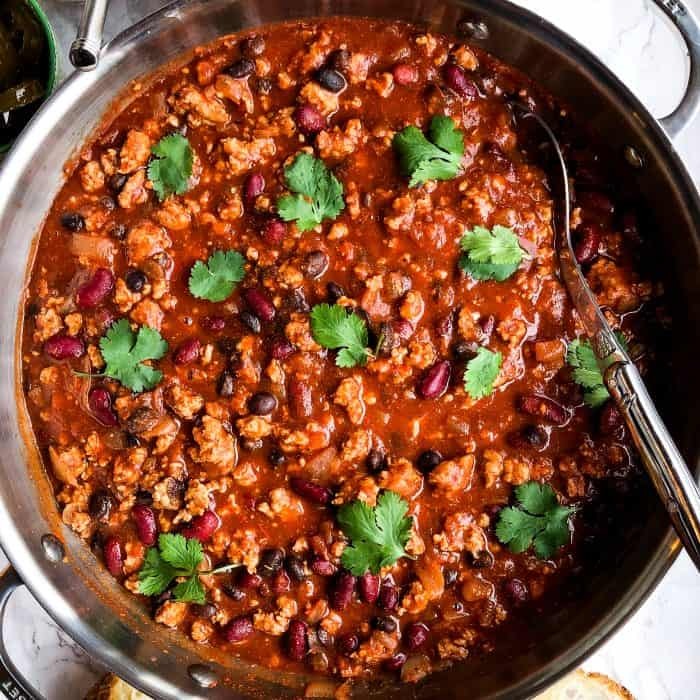 This Easy Homemade Chili is so filled with hearty ground turkey, but you can also use ground beef. We add our favorite beans, tomatoes, and the perfect blend of spices. Oh, and did you know you can make your own homemade chili powder? The secret to good flavor is adding onion. I know, kids don’t really like onions, but I say either grate them, or chop finely, because they’ll never know! I promise! 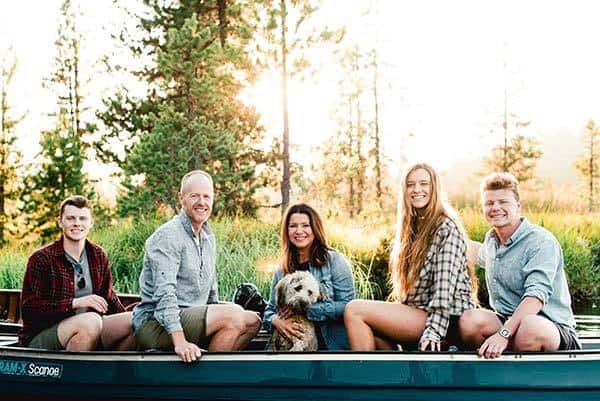 When it comes to having people over for a casual meal, I want to help you move past all of these obstacles and excuses you may have. Like, I’m not a good cook. My house isn’t big enough. The schedule is too packed to get a date on the calendar, etc. There’s always a little stress in hosting, friends, because it takes intention, investment, and time. But it’s so worth it! If you have a table, and you can pull up enough mix-and-matched chairs, or even add an extra table, then you’re set. You can use cloth napkins (I have stacks that I’ve used for years. I wash them over and over again :) Or, you can use paper napkins. The secret to hosting is to make that invite. Don’t plan on perfection. 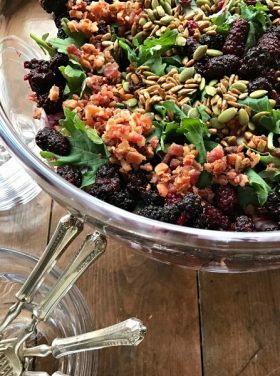 Serve one easy recipe, and let your guests bring the rest. 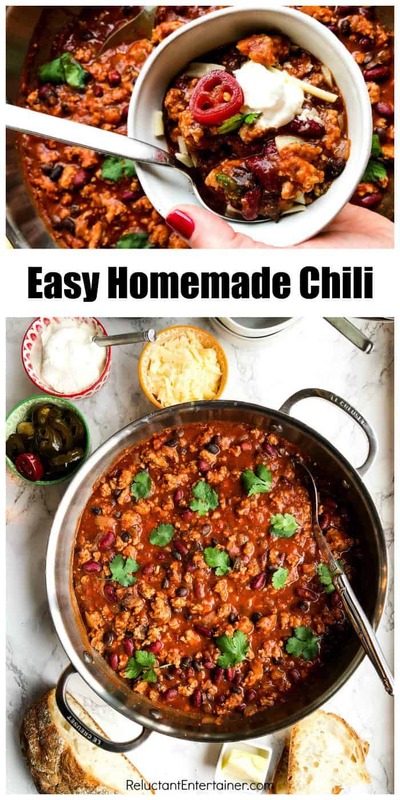 In this case, I made this Easy Homemade Chili, and our guests brought the rest of the menu. You can’t make it more streamlined than that! Ice cream (because it’s easy) (me) OR … if you have time, make my Best Chocolate Hazelnut Brownies! 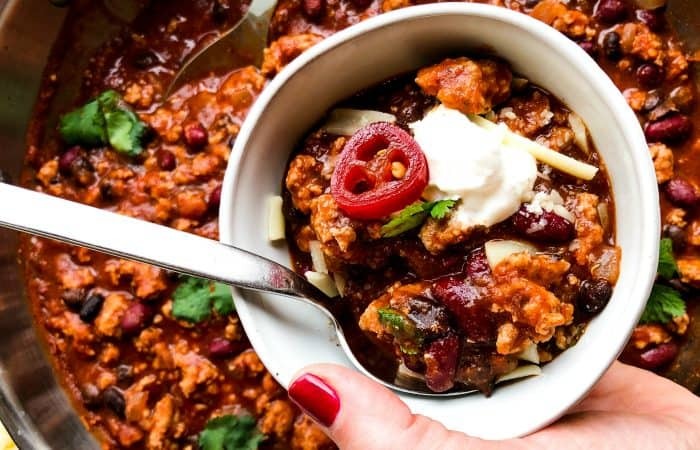 Homemade Chili, while it may feel a little casual, is the perfect meal to serve a family who is coming over. 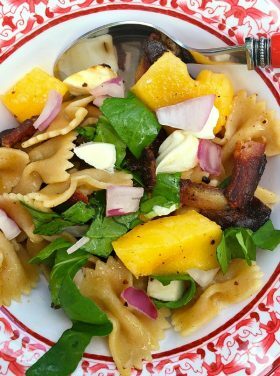 It’s easy, tasty, and with the right toppings, everyone can “make their own” and enjoy the flavors the way they like it. Since we moved to our mountain home, I’ve really enjoyed more casual hosting. We use our bar, or center island, for setting out the dishes, adding the food, and creating a buffet line. Then everyone sits down to a simple table, and digs in! 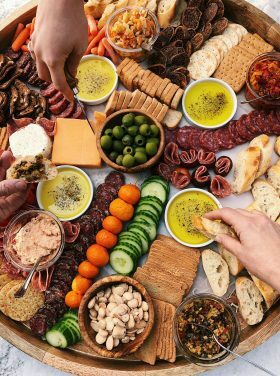 Don’t forget a “chips and salsa board” is really delicious for serving with a big pot of chili, too, if you want to SKIP THE BREAD. 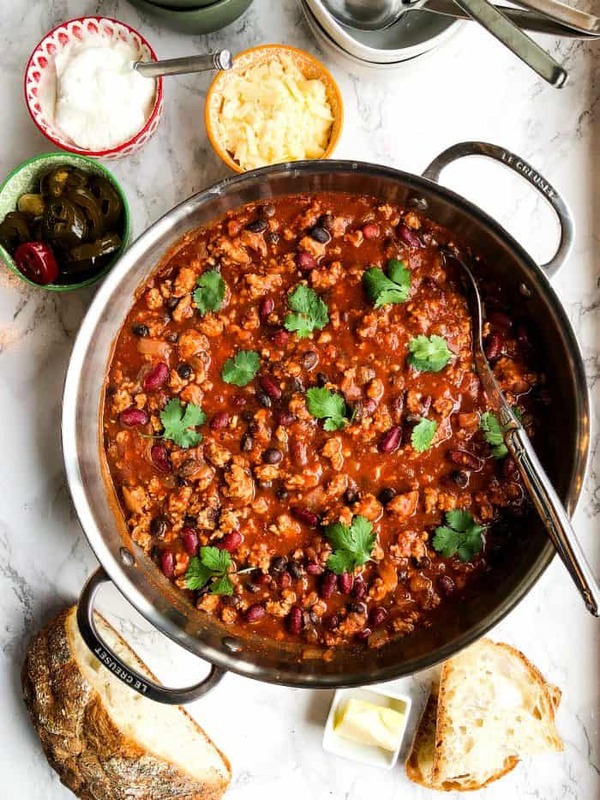 Friends, you can try my quick and easy Instant Pot chili, or also make this recipe in the slow cooker. Cook the onions, and meat. Add the spices. Place all ingredients in a slow cooker and cook on LO HEAT for 4-6 hours. If you use HI heat, I recommend only a few hours. 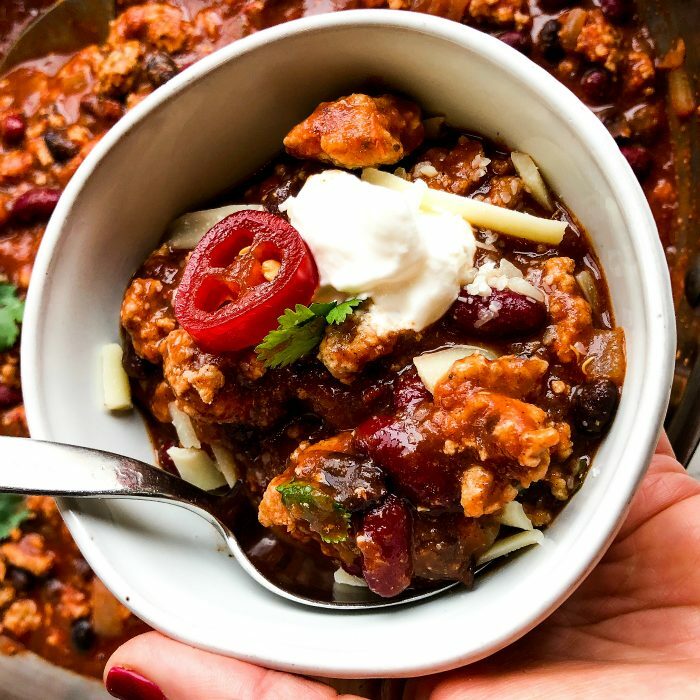 We also love this Instant Pot Mango Chicken Chili Recipe! You may also want to try One Pot Chili Mac & Cheese or White Chicken Chili Recipe. 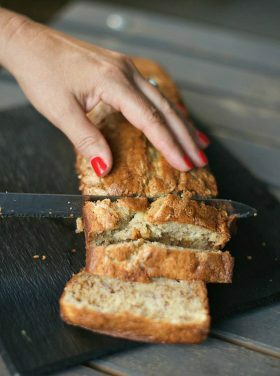 Halve the recipe to serve 6-8 guests. To the meat mixture add the tomatoes, beans, and all the spices. Stir thoroughly. Bring to a simmer and cook for 1 hour, stirring every 15 minutes or so. 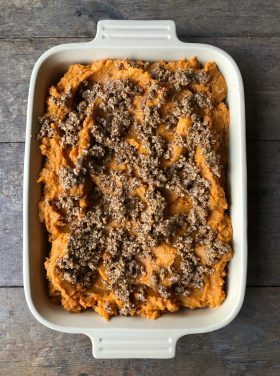 Slow Cooker Instructions: Cook onions and brown ground turkey, add all the other ingredients, and cook for 6-8 hours on low, or 3-4 hours on high. 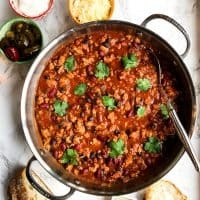 I love an easy chili or taco soup on a rushed night or for company…in fact I’ve served it twice when we’ve had get togethers. Guests loved it.